The skid steer story continues. What began as a quirky tale about a small, three-wheeled manure-scooping machine has turned into a saga about a versatile tool-wielding workhorse with options of both tracks and wheels. No longer revolutionary, the compact machine today is evolving in purpose, capacity and sophistication. End-users are the catalyst for much of the change. They are pressuring manufacturers to introduce features that will not only let them do more with their skid steers and compact track loaders, but do it more efficiently and safer. In response, manufacturers are introducing innovative engineering and software solutions to meet these marketplace expectations. At Caterpillar, engineers made what product specialist Kevin Coleman calls “discreet decisions” in developing high-flow hydraulic systems for their skid steer/compact track loader lineup. High-flow hydraulics are not unheard of, but Cat engineers tweaked systems and components to develop high-flow hydraulics that also are higher pressure. “It is not really new, but it is somewhat unique from the standpoint of high-flow solutions that best fit customer needs,” Coleman says. Cat offers two systems — the High-Flow XPS, which bumps the hydraulic flow rate on smaller models to 30 gpm from 20 gpm, and the XHP system for the manufacturer’s largest model, which increases flow to 40 gpm from 33 gpm. More to the point, the pounds per square inch component of each of the systems jumps to 4,061 psi. He playfully drops his voice and slows his words in describing the “lower and slower” characteristics of standard flow systems in undertaking tasks demanding more hydraulic power. Bobcat’s full-color rear camera keeps an eye behind. Deere’s larger skid steers and compact track loaders also now can be equipped with an “electrohydraulic boom performance package.” The programmable assists were designed to help operators doing repeatable loading and lifting tasks by eliminating the need for repetitious manual adjustments. 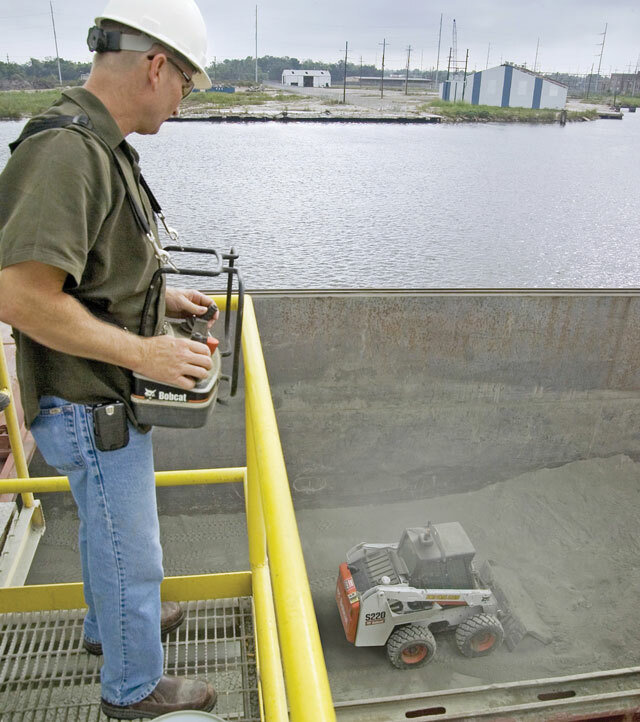 These include bucket self-leveling at every stage of a lift and return-to-dig and return-to-carry positions as well as a locked-in boom height control. 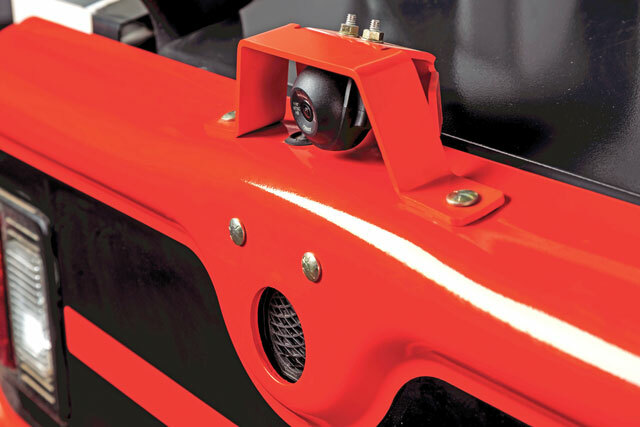 Bobcat — the manufacturer that wrote the first chapter in the skid steer story — is offering operators a full-color rear camera kit to keep track on what’s happening back there. The rear display is on 4.3-in. anti-glare LCD monitor with a backlit screen. Jason Boerger, Bobcat marketing manager, notes that the camera and monitor are intended for use in all applications including construction. The camera and readout display have been engineered to be dust and water proof. Internal heaters in the camera keep condensation and ice from the lens so operators can see clearly behind them in any environment ranging from crunchy -40-degree Fahrenheit days to sweltering 185-degree days. Such extreme work conditions are, admittedly, rare, but operators cannot use camera dysfunction as an excuse to beg off when the extremes occur. Last year, Bobcat introduced a 5-link torsion suspension undercarriage on its M2 Series T870 compact track loader. The system provides greater stability during grading work and smoother rides generally. It is a durable undercarriage and reduces track wear with an automatic track tensioning system to ensure optimal life for the track. 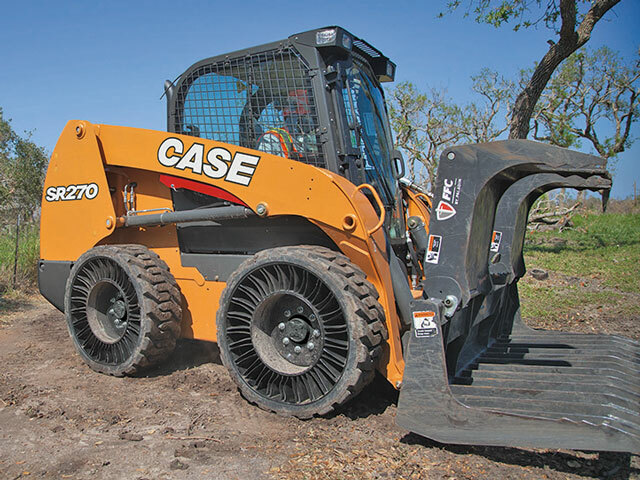 Other fresh engineering innovations where the rubber meets the soil include airless radial tires, which are now available on all Case Construction skid steer models. 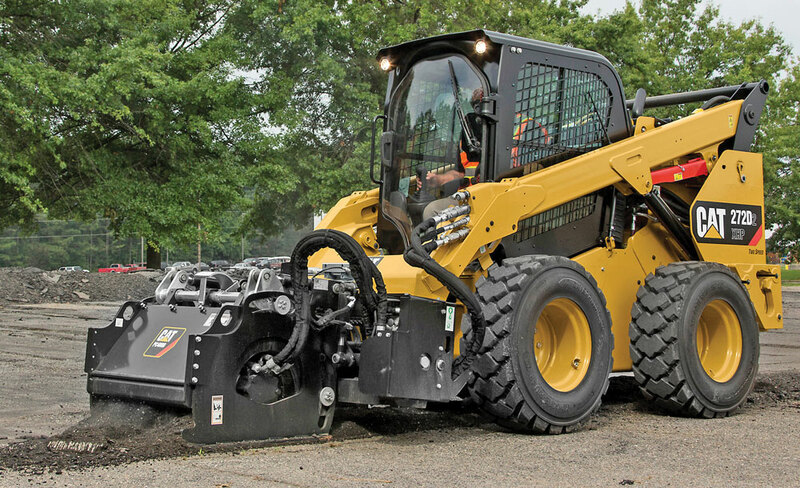 The Michelin X-Tweel SSL tires are factory-approved additions to the Case skid steer lineup. The all-terrain airless tires are said to have a life two or three times that of pneumatic tires and can be retread numerous times. Michelin’s airless X-Tweel SSL tires are factory-approved additions to the Case skid steer lineup. JCB continues to build its reputation as a single-boom alternative to twin-boom skid steers. Last year, it launched its “teleskid” model, the first telescopic boom for compact machines. The sliding boom gives JCB industry bragging rights for best reach, depth and height. All of these evolutionary advances in skid steer/track loader technology come at little or no sacrifice in reliability. “Some people believed that the introduction of electronics and complex components would mean more failures. What we have seen is that the durability of our components is better today than in the past,” Zupancic says. Bobcat already offers remote control technology. AI is next. AI in compact equipment will hopefully be a thing soon. Doosan Bobcat North America thinks so. The company has partnered with SafeAI — a startup located in Silicon Valley — to explore how advanced artificial intelligence (AI) technologies could be incorporated into Bobcat equipment. Through this pilot program, SafeAI plans to demonstrate how the latest AI technologies, Deep Neural Networks (DNN) and Deep Reinforcement Learning (DRL), can be used to perceive complex dynamic environments around equipment and provide automated control. Check out more about track loaders here.